As a dad who is the primary caregiver at least two days a week, who cooks a huge portion of our meals, and does a lot of stuff that we were all raised to think of as “women’s work,” I raise an eyebrow when the mom label gets used on stuff that doesn’t need it. Feminine hygiene products? Sure, a sticker that says “made for a woman” is appropriate. But a cookbook for people who are cooking for a family doesn’t need to be a “mom’s” cookbook. Really, it doesn’t. And while I am sure the title of this book, The Mom 100 Cookbook, makes sense because it was written by a mom, it sort of limits the audience to where I was going to skip it altogether. And this, my friends, is where having an open mind and thick skin pays off. I looked beyond the cover that told me “This book is not for you, man-person” and found a GREAT cookbook that didn’t actually require me to have lady parts. Small confession: I am a bit of an addict when it comes to cookbooks. We have a cabinet in the kitchen especially dedicated for a large collection of books that illuminate everything from how to boil and egg and bake a potato, to the proper preparation for traditional samosas and a special marinade from the Black Dog on Martha’s Vineyard. I love cookbooks. Even when they don’t always love me back. That’s one of the reasons I like this back-to-basics collection of recipes from Katie Workman. The Mom 100 Cookbook gets it right. The recipes are simple but delicious�some healthy, some not so much�and they all turn out like they should. Perhaps by some fortunate aligning of the stars the author’s test kitchen is calibrated the same as mine. Or maybe after 30 years I am finally getting a hang of recipes (though I’ve always been loose with direction in the kitchen). Whatever the reason, I follow Katie Workman’s recipes, and the meals turn out pretty solid. The organizing principle here is a series of scenarios and dilemmas , the kind of thing parents are hit with at least once a week: finding healthy snacks; how can I make chicken less boring; what, we’re going to a potluck?! So far I’ve found myself using these categories a half dozen times when faced with culinary conundrums. Each of these 20 chapters has five recipes (often variations on a theme) that add up to 100 recipes in all (thus the title). All the recipes are pretty basic fare, but there are a lot of suggestions for changing it up a bit. 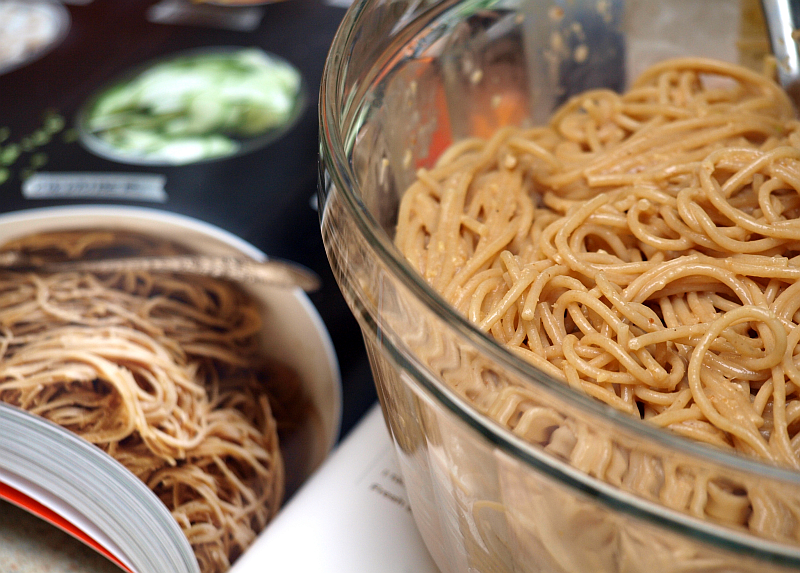 For this post, we tried the Sesame Noodles, which is found in the chapter on pasta. 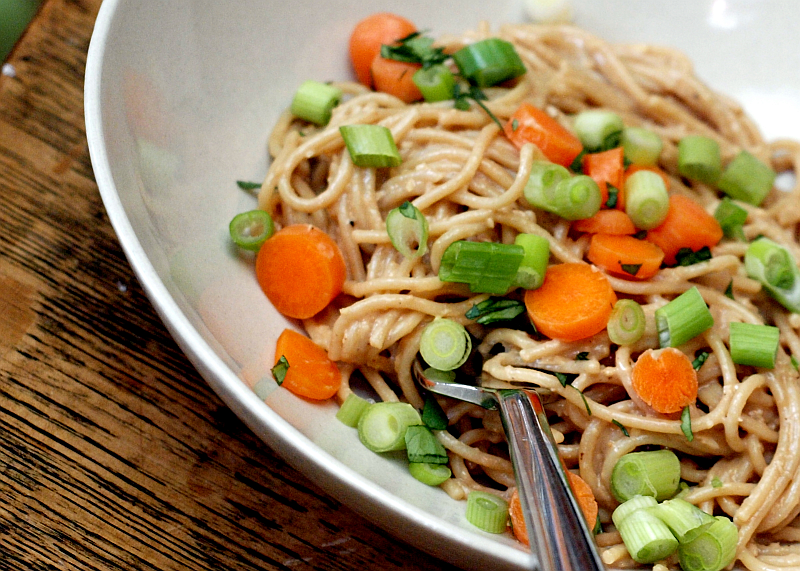 Peanut butter sauce, regular spaghetti, and some fresh veggies. I over did it on the sauce not taking into account our shortage of noodles, so it was a bit looser than I expected, but it was a big hit with the family. There are also dozens of great ideas for including your kids in meal prep. As a controlling dad in the kitchen, this pushes me a little beyond my comfort zone. But there’s no good excuse for keeping kids out of the kitchen, and these suggestions are great guidance for someone who’s never quite sure how much to let children participate. Father’s Day is past, but perhaps for dad’s birthday you can skip Cooking for the Man Cave and get him a copy of The Mom 100 Cookbook.